Essential to complete any solid wood bedroom set is the nightstand. 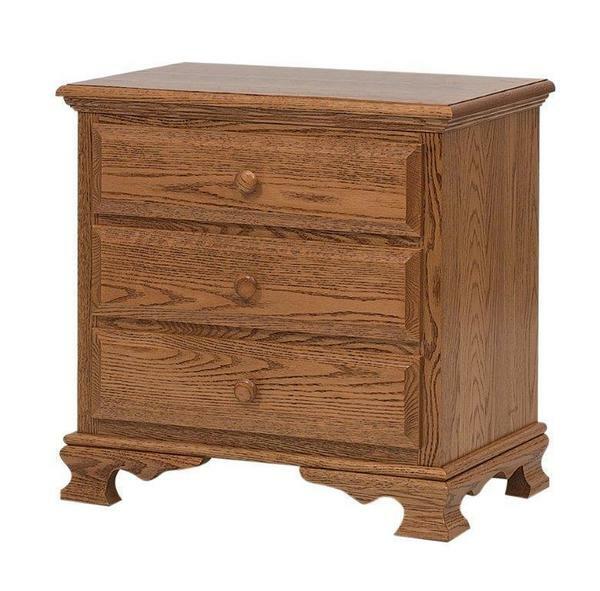 The Amish Heritage Nightstand with Three Drawers creates a warm glow as you enter the room. Completely customizable, this Amish nightstand is handcrafted in the solid wood and stain of your choice. The Heritage is shown here in solid oak wood, which is celebrated for its strength, durability, and beauty. Oak is a heavy, strong and light colored hardwood and is ideal for creating a warm ambiance. A solid wood nightstand like the Heritage is convenient and functional. Your nightstand provides a surface essential for your phone, water, and prized novel to be kept nearby, within arms reach. Ample storage space is offered here with three spacious drawers to hold magazines, movies, lotions and more. Customize your bedroom nightstand even more by adding soft close drawers that respond to a light tap. Our collection of Bedroom Benches offers stunning seating options for your solid wood bedroom collection. Keep them in mind while selecting your bedroom furniture. Call one of our Amish Furniture Specialists today at 1-866-272-6773 with any questions. We are happy to assist you.